Thanks to Grenada, Cavaliers find themselves in an unusual place—as spectators in the BVI Cricket Association LIME Twenty 20 League. Grenada used a 14 run victory to booth the Cavaliers from the league on Sunday in the knockout stage of the competition, marking the first time in the shortened form of the game’s history that Cavaliers—who have won four of the last six titles—will not at least play in the semifinals. Grenada went about the task of posting 250-7, using Daniel Frederick and Derol Redhead’s 87 opening partnership, before Frederick departed for 43, to reach the league’s semifinal. Redhead and Rodney Marryshow followed up with a 72 stand for the second wicket before Redhead later fell for 71 including 11 fours as he reclaimed the Nagico Green Cap for most runs scored in the tournament so far with 357. Marryshow had six fours and six sixes in his 67, and moved to the top of wicket takers so far with 12. Cavaliers’ Christianand Dhanpaul bagged 2-33 and took three catches while captain Jagnarine Persaud, grabbed 2-41. In reply, Cavaliers were 236-7, but Grenada’s Francis Kitason destroyed their middle order with spell of 3 for 9 including wickets of Aaron Baker, (30) Persaud and Mohamed Hassan, to finish 3-33. 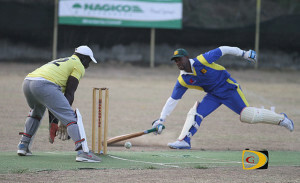 Kwesi Sinclair contributed 38, Teddy Nankishore 31 and Dhanpaul 37 not out, in ending Cavaliers successful Twenty 20 run. Thomas said once they have that team unity, they will continue to be victorious and they are eyeing their first title. Police forfeited their game to Vincy. Vincy ended up playing a friendly against Under The Tree, whom they easily beat. Under The Tree were 136-9 in 15 overs with Sezzie Ellis’ 30 the top score. Kevin Thompson added 22. Vincy’s Roy Cain snatched 3-11 and Tuby Xavier, 2-30. Vincy openers Kenrick Leslie and Sylvester Mitchell had a 92 opening partnership that laid the foundation for their victory after reaching 137-4. Leslie had 55 and Mitchell, 42. With defending champs Vikings joining Grenada and Vincy in the semis, the final semifinal spots will be decided between Royal Knights, Under The Tree and Police and could be determined by run rate according to BVI Cricket Association officials. All three teams are expected to see action this weekend.